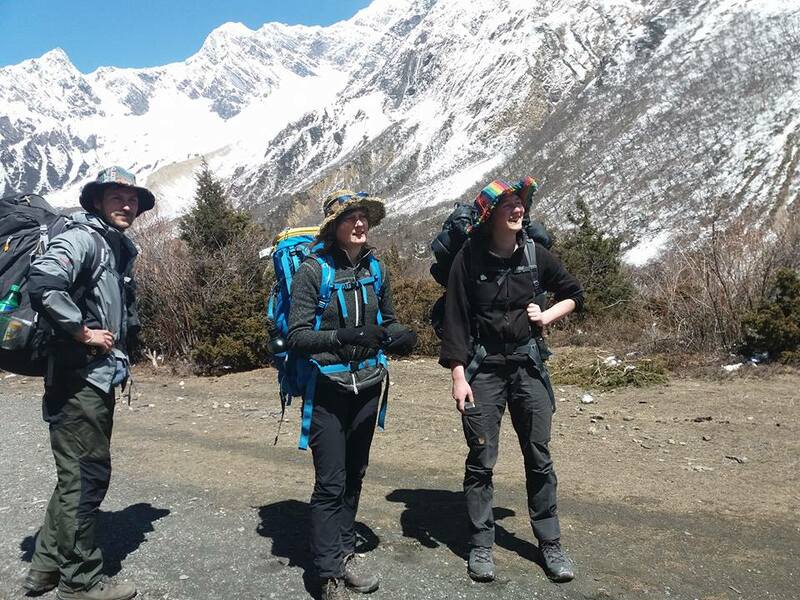 Manaslu Trek is a well-loved trekking walking route, providing with pristine mountain views, rich culture and genuine adventure sum up the trek experience around the 8156m Manaslu. Opened in 1992, this area offers a combination of rich culture heritage, supreme beauty and biological diversity. Barpak, a beautiful Gurung village of Gorkha was the epicenter of the devastating earthquake (7.8 Magnitude) that took place on 25th of April 2015. The entire village was totally ruined by the earthquake. At least 25 people and many domestic animals (buffaloes, cows, goats, sheep, hens etc were buried and killed. Many were adversely injured. Manaslu at 8163 meters (26,775′) is the 8th highest peak in the world and is located near to the border of Nepal and Tibet. 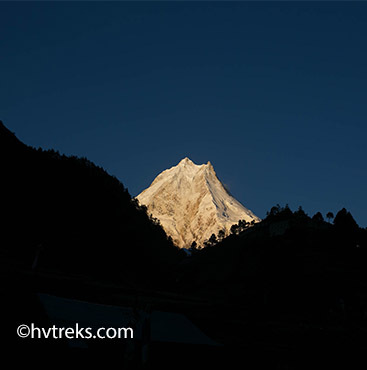 The name Manaslu means “The Spirit-Mountain” in the local dialect, referring to the benevolent and strong deity, which dwells within. 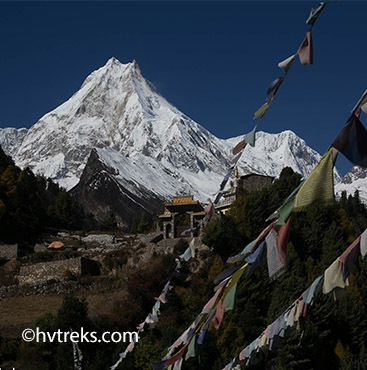 Trekking in Manaslu through Himalayan Vacation Treks and Expedition is one of the most delightful adventures. 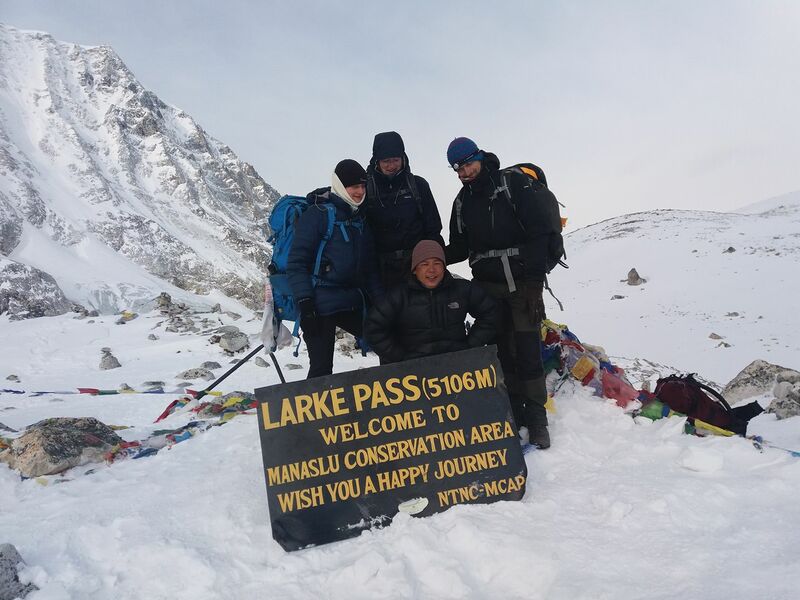 If you would like to sample both extremes of the trekking experience in Nepal, and really get to see what all the fuss is about in terms of the most breath-taking mountain scenery on earth, then look no further than the circuit of Manaslu via the Larke La. 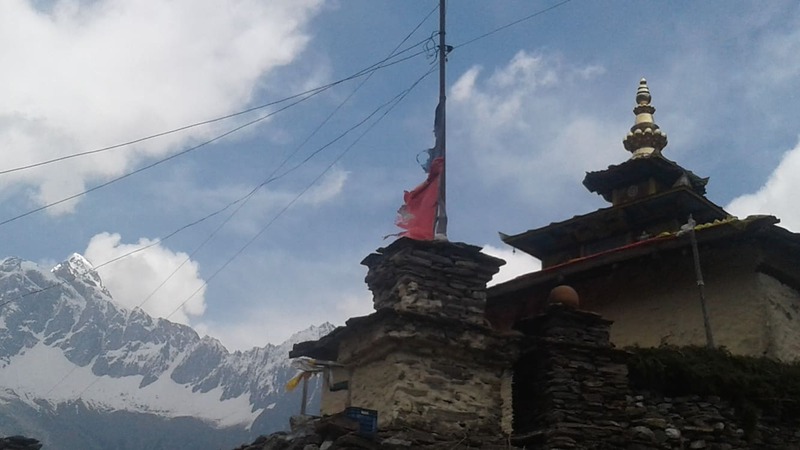 The Tibetan enclave of Nupri, north of Manaslu at the head of the Budhi Gandaki, was closed to foreigners for years on account of its proximity to Tibet. The area was surreptitiously opened in 1991, but it took several years for the word to get out. Our Guest’s security is of dominant concern while traveling with Himalayan Vacation Treks and Expedition. The trekking leader has the authority to adjust or cancel any part of the itinerary if it is necessary due to unfavorable circumstances. Unfavorable weather conditions, the health condition of a group member, or an unexpected natural disaster can force changes to the itinerary. However, every effort will be made to keep to the above itinerary. The lead guide will try his/her best to ensure that the trip goes smoothly and according to plan, but please be ready to be flexible if necessary. Himalayan Vacation Treks and Expedition is capable, experienced, and prepared to give 24-hour emergency response to any accident or condition that requires attention or evacuation. Welcome to Kathmandu, capital city of Nepal full of historical monuments, Hindu Tempales, Buddhist Monasteries. We receive our valuable guests at the Tribhuvan International Airport in Kathmandu. One of our company staffs will be waiting to welcome our guests with a display board that reads Himalayan Vacation Treks and Expedition Pvt. Ltd. The guests are dropped at the hotel and taken to the city for a short sightseeing. Then in the evening the guests are served Welcome Dinner in a typical Nepali restaurant. A tour guide from our company takes the guests for sightseeing in Kathmandu. The sightseeing includes Pashupati area, Boudhanath, Patan and Swoyambhunath area. The time for sightseeing begins after breakfast; it goes generally 9.00am to 5.00pm. On the same day the companies makes the permit and do other paper works for the trekking. Today, we start trekking from Kathmandu. We begin our trekking with bus ride from Kathmandu. We pass through Thankot , the gate point of Kathmandu Valley. We follow Prithivi Highway which contains many uphill and downhill fine tarred road. We follow the famous river Trishuli until we reach Mugling. After 15 minutes bus ride from Mugling., we reach Khaireni and diverted to 12 Kilo leaving Kathmandu Pokhara Highway. From 12 Kilo we follow Daraudi river via Chhepetar . We follow offroad from Chhepetar and reach Baluwa. We stay overnight near Darkhu Khola riverside. Today, we start walking from Baluwa with flat path for 1 hour to cross Rangrus bridge where Tangrung Khola and Rangrus Khola meet. Later we start climbing uphill upto 3 to 4 hours. The trail contains Jungle and green hills which lead us to Barpak . Barpak is a famous Gurung village which contains about 1100 houses. This is facilitated by communication ,schools and clinics.Here is Boudha Gompas and Monasteries. The splendid view of Boudha Himal is seen from here. After the devastating earthquake of April 25, 2015 the path has been slightly damaged by the landslides. But it has no that much effect on the trekking routes. Barpak is a very big and beautiful Gurung village which now has been totally ruined by the earthquake. The people are rebuilding the village gradually. The lodges where we spend the night are not much affected by the earthquake. They are safe. In the afternoon we have time to explore the village. Barpak is a large village consisting of a Hindu and a Buddhist area. We stay overnight at Barpak. We walk down to the Budhi Gandaki River from the village of Laprak today. We cross a suspension bridge and we climb steep path that goes through the terraced fields. We contour around several hillsides through a narrow path up to the village of Singla. From here, the walking becomes easier and we enjoy the views of Kutang Himal and Sringi Himal to the north as we walk down through more terraced fields and papaya trees, through the Gurung village of Khorla, and then down along a narrow, winding trail to Khorlebeshi on the bank of Budhi Gandaki River. We need to be careful since we walk through the rocky path just before the long suspension bridge to Khorlabeshi. We will probably get a visit in the evening from this village’s cultural ambassadors, and perhaps have another show for our entertainment. We start walking along the river for about an hour. Then we walk by the terraced field of tobacco and buckwheat. After some time the path becomes stony that leads us to the hot springs in the center of the small, terraced village of Tatopani, Here we can enjoy for some time to soak our exhausted bodies in the garrulous hot water, and then perhaps go for a swim in the ice-cold river below, drying off on the wonderful river-side beach. Then a slight climb through the woods past with a spectacular waterfalls, across an old, wooden suspension bridge and through a short section of forest path and we reach Dobhan. Above Dobhan, the Bhudi Gandaki River flows down in an impressive series of steep rapids. From here, our path climbs high above the river. 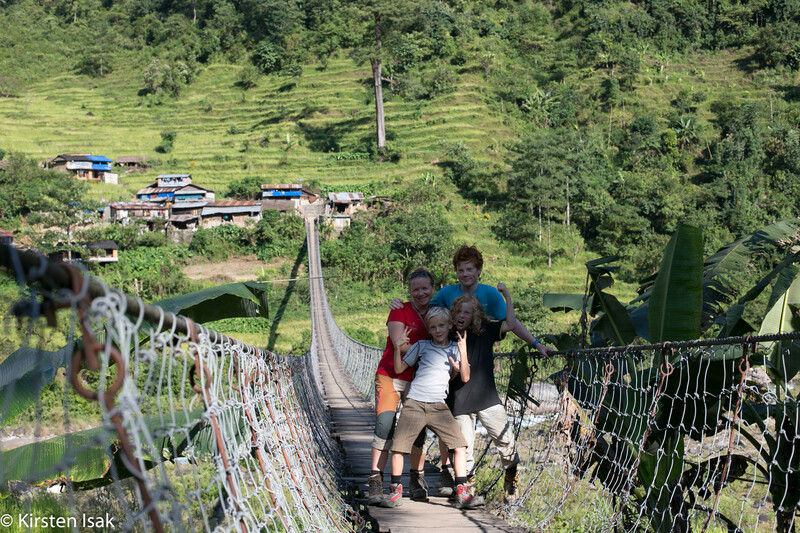 We cross the river on a long, new suspension bridge and climb high on stone steps before coming into our camp at Jagat, the entrance to the Manaslu Conservation National Park. It will be really good to wander around this beautiful, paved village. After descending a long series of stone steps back down to the river from Jagat, we climb on wonderful stone steps along a terraced hill-side to the small hamlet of Saguleri, from where we can see the impressive view of Sringi Himal 7,187 meters high. We pass through the charming, paved village of Sirdibas. We Cross the river again on a long, high suspension bridge at Ghata Khola, the path splits, with the right-hand branch heading off towards the Ganesh Himal. Our route continues upstream, and again we have a steep climb to reach Philim. After Philim the path still goes uphill to Ekle Bhatti where we camp for the night. In the beginning the path goes flat then downhill to Budhi Gandaki River. We cross a new suspension bridge over Budhi Gandaki River at the point where the Siyar Khola meets with the river. From this point before we cross the bridge our trail splits. One goes to the Tsum Valley. The other leads us to village Bihi Phedi. After crossing the River, in one hour’s walk at the place called Nyak the ending point of Rupina La treks meets with our path. We catch the route that takes us to the village called Bihi Phedi where we will spend the night in a lodge. After Nyak, from Deng we can have a spectacular view of Shringai Himal. Deng is a small Gurung village where the Buddhist culture is practiced. So Mani walls and prayers flags welcome us here. After Deng the path goes downhill upto Budhi Gandaki River. We cross a Trust bridge over Budhi Gandaki River and walk uphill to Bihi Phedi. In the beginning, slowly going uphill but after lunch we walk through steep path and we have to walk through the trail that has landslides, wet pieces and slippery stones. We are now completely turned to the west and the Tibetan border is less than 10 km from of us. We are now entering the area inhabited by Tibetan refugees. 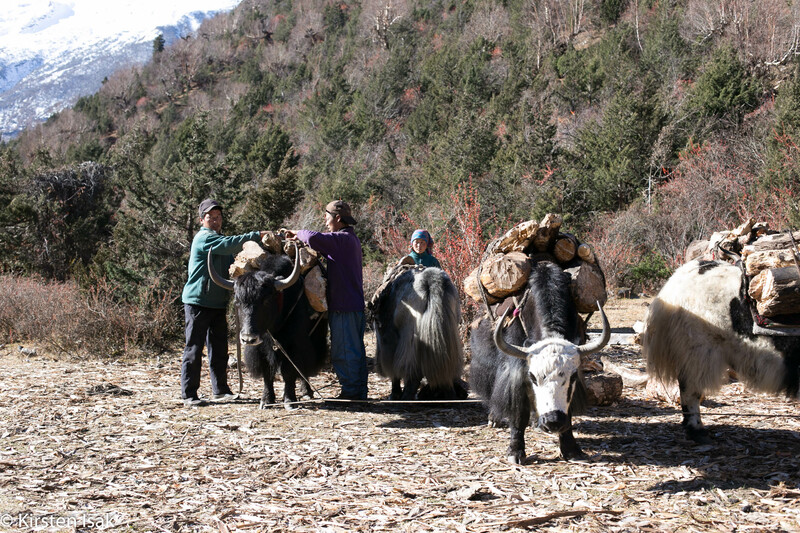 Hence, the sight of Tibetan culture and lifestyle is common in this area. The trail goes uphill and downhill both. At Namrung, our special permit will be checked. This is village where there is hydro power station. This is the view point of Shrigai Himal and Ganesh Himal. There is a famous beautiful gompa called Namla Gompa. We can make telephone call here. We spend the night at Namrung. A few hours later, we reach the village of Lihi at 2840 meters, a substantial altitude gain. We climb gently now; soon we cross a large stream flowing down from the Lidanda Glaciers. We pass the gompa of Lihi and continue to rise until we go through the stone gates of Sho. Lihi is the view point of Himchuli too. 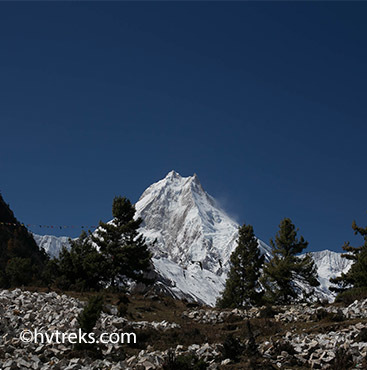 A little later, we have a magnificent view of the Naike Peak, Manaslu north and eventually Manaslu Peak. Lho is a beautiful village. In the east we have a view of the peaks of Ganesh Himal and north to the glaciers on the mountains that form the border with Tibet. We can visit the Kandjur Scripts monastery of Lho and Ribung Gompa. 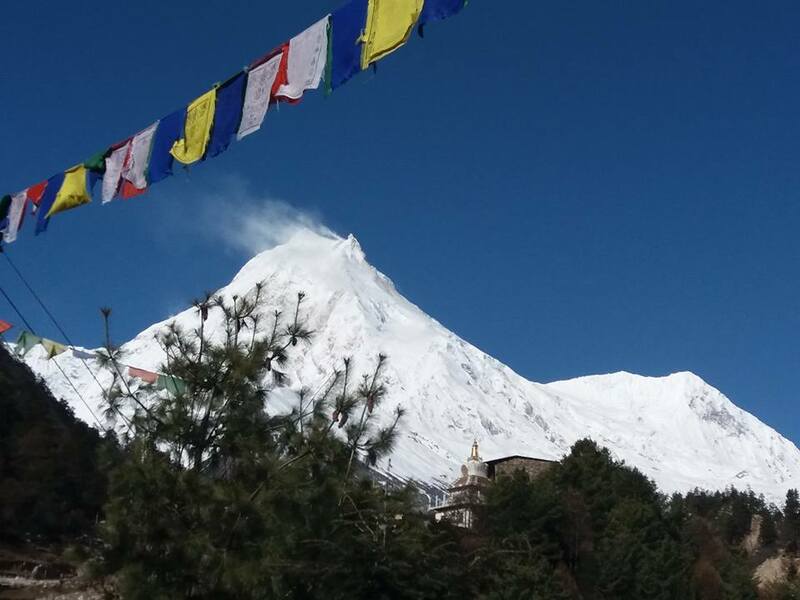 Lho is the view point of Manaslu. We can make telephone call from Lho. We walk a downhill to the river in the beginning. Then the path goes slightly uphill along the river. We cross small jungle area in several places. We arrive to Shyala. It is a comparatively new village and is populated by Tibetan refugees who are still on the old trade route through the pass called Lajyung Bhanjyang. We cross Numala Khola through the suspension bridge and walk to Samagaon which is a very beautiful Tibetan village. We stay her e for 2 nights. Today as it an acclimatization day, we can have just rest for the whole day or there are so many things we can do. Maybe we can get a hold of Puja (prayer) in the gompa or the monastery. We can bathe and make washing. If we wish to observe Tibetan culture, we can walk through the village and see how the Tibetan villagers live and work in this region. We can make a walk to the Birendra Lake or a piece of way to Manaslu BC or a longer walk to Pung Gyen Gompa also is the things we can make. The Gompa is in the altitude of about 3900 m on one of the slopes along the Numla Khola. This is point from where we can see the view of Manaslu, Larke, Naike Peak , Manaslu glacier etc. Himalayan Vacation Treks and Expedition guide will arrange for our visit to the various places today. Today we have a short trek along the Budhi Gandaki River. Since we are walking in the high altitude, we slowly acclimatize. We climb uphill gradually. Slowly we feel the cold wind as we climb up. So, the warm clothes in your rucksack are suggested. We follow the Budhi Ghandaki in a northwesterly direction to the last inhabited village before the pass. We walk through yakweiden with dozens of meters long manis. We have camp in Samdo in a lodge. Telephone service is available here. Mani walls and stupas can be seen everywhere here. 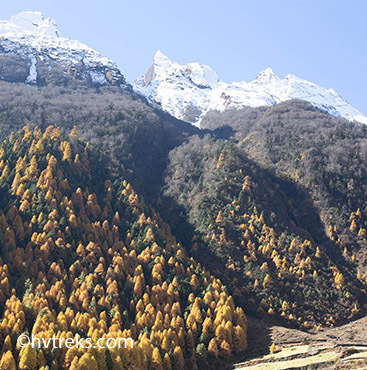 We can visit to the view point from where we can witness Naike and Pangboche Peak. We walk today flat first then slightly uphill. We have to take it easy because today we rise about 800 meters and tomorrow await us a hard day as we will cross the pass Larke La. On the south side of the path we have a view of the North Peak, Naike Peak and the Larke Peak and the Manaslu massif and to the north, the barren, rough stone desert that lies between us and the Tibetan plateau. This will be the coldest night on this trip and probably also the shortest. We spend the night in a lodge in Dharmashala in the other word Larke Phedi. We get up very early and leave early because today because may be most of the snowy pass and which may in particular make the long steep descent difficult and time consuming. The run-up to the pass is gradual and hopefully it’s a bright sunny day so that, once the light is able to enjoy the impressive landscape. Moraines, glaciers, snow-capped peaks which stand out stridently against the blue sky and the icy glacier lakes are the view of surrounding. The pass is not really showing signs of a sharp transition but the prayer flags tell us that we have arrived at the highest point. We too, hang our prayer flags in there. In the succeeding descent it goes again slightly uphill and then comes the long and very steep down but we occasionally take the time to enjoy the extraordinary view. Only at the moraine path becomes less steep and the going easier. Along the moraine-shore we walk to the large lawn with some houses. We walk for long hours today; we must bear in mind that average of 10 to 11 hours walk including a few short breaks along the way. But the duration can vary since it depends on the local conditions like weather. In the evening we are very much exhausted but contented today. We stay in a lodge for the night in Bhimthang. Bhimthang has telephone service facility. Bhimthang is an open place and beautiful place to have rest after crossing the Larke La pass. Especially Nepali staff s would like to enjoy drinking the local alcohol here and enjoy the rest. The trekkers also can join the drinking party. 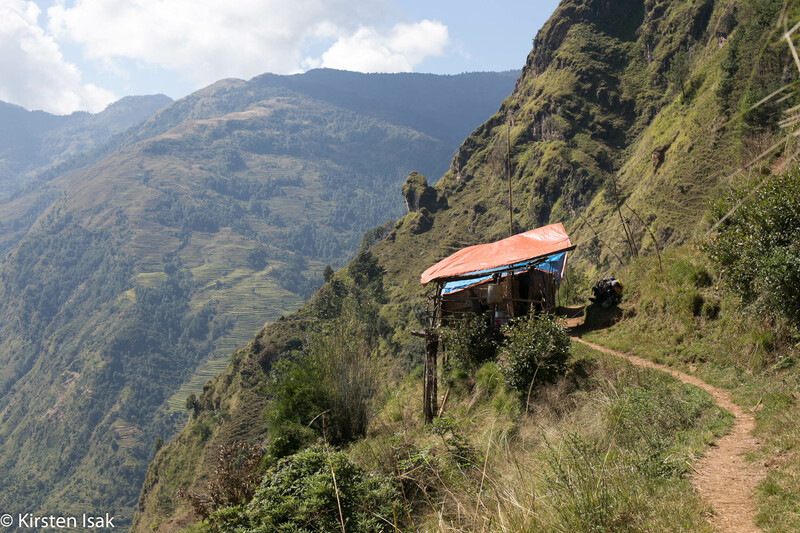 There are only the tea houses for the trekkers to stay. No people live there in winter since it is very cold. There is a view point of Lamjung Himal, North-East face of Manaslu, South face of Phungi, Cheo Himal and North-West face of Himlung at Bhimthang. We can enjoy the spectacular views today. We just rest for the whole day enjoying the views, taking photographs or sleeping the bed to have full rest. If we wish, we can visit to the nearby Himalayan beautiful lakes; Nayamlo Tal and Ponkar Tal today. We go there crossing Salpudanda Glacier. Himalayan Vacation Treks and Expedition guide will arrange for our visit to the various places today. We may go to visit the beautiful lakes named: Nayamlo Tal and Ponkar Tal. Today our journey goes down slowly. In the beginning we walk through glacier shore. Then beautiful forests with great views of the peaks of the Manaslu behind us, we walk quietly along the river to Kharche. First a horrible climb over the Pass of Kharche but then mostly down along moraines, yak kharka, white beaches and rocks along the river that swirls down and called Dudh (milk) delivers. Also, we see beautiful view of waterfalls and the forest with mosses. We love the path that has a view of the magnificent mountains around us. We cross the Suti Khola, a river coming from the Suti Glaciers in the northwest and flows into the Dudh Khola. After crossing a bridge over Suti Khola, we have a camp at Kharche. We walk down along the Dudh Khola. We slowly head to the big Gurung village of Tilje, where we can visit to Tilije Gompa. Telephone and NTC mobile service is available here. Apple Wine and brandy is produced here since the apple orchard is there. We can have taste of local wine, alcohol and other products here. We leave the Gurung village of Tilje and walk downhill to the point where the Dudh Khola comes together with the Marsyangdi River. We reach the Annapurna trail. At Dharapani we go over the bridge to the west bank of the Marsyangdi and we will check with the post mark to let our permits because the check post of Annapurna Conservation Area Project and Manaslu Conservation Area Project lies here. We are now in a completely different world with many tea-houses, restaurants and lodges in comparison of the routes we walked in the past. We head down to Tal. Tal is a typical village with the majority of Gurung and Magar tribes. We walk down along the Marsyangdi River. We cross the villages like Chamje, Ghattekholagaun and Jagat. These villages also have the majority of Gurung and Magar tribes. In some places beautiful views of waterfalls welcome us on the way. We finally reach Syange a small village beside the river bank of Marsyangdi where we stay overnight. We can witness many beautiful waterfalls here in Syange. This is the ending point of our trekking. Tomorrow we will drive to Kathmandu. Sometimes we have direct bus service from Syange to Kathmandu. If not we get in a jeep up to Besi Sahar; the headquarter of Lamjugng District. Then from Besi Sahar, we can take local bus to Kathmandu. Until Besisahar the road is rough as it is just graveled. But from Besi Sahar, the road is pitched. At Dumre we reach the road that runs from Pokhara to Kathmandu. As well as on the way we will have lunch in Muglin. The drive will take 6 to 10 hours. It depends on the situation of the road traffic and especially the pass to the Kathmandu valley can sometimes cause delays. This day you spend on your own either looking around Kathmandu, buying souvenir for your friends/family or you can have full rest or prepare for going back to your home country. Or if you wish you will be taken to Bhaktapur for sightseeing for 4 hours. But you have to extra charge for this. In the evening you will be served the Farewell Dinner by the company. Today, we check the list of all necessary documents and goods of our guest. We confirm the flight tickets before 72 hours of departure flight. We advise our guest to put passport and tickets at their handbag for convenience. 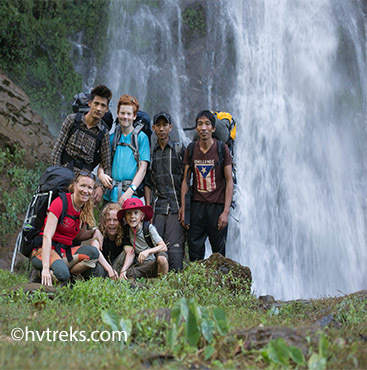 Himalayan Vacation Treks and Expedition staff representative will take our valuable guests to the airport (3 hours prior to your flight) and bid goodbye. It will be not only goodbye, but also the welcome for next visit to Nepal.